Inside, however, Able remains a boy, and he must grow in every sense to survive the dangers and delights that lie ahead in encounters with giants, elves, wizards, and dragons. His adventure will conclude next year in the second volume of The Wizard Knight, The Wizard. 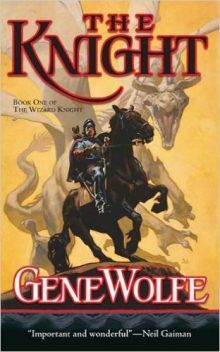 Gene Wolfe is one of the most widely praised masters of SF and fantasy. He is the winner of the World Fantasy Award for Life Achievement, the Nebula Award, twice, the World Fantasy Award, twice, the John W. Campbell Memorial Award, the British Fantasy Award, and France’s Prix Apollo. His popular successes include the four-volume classic The Book of the New Sun. T. H. White. This is a book—and a series—for the ages, from perhaps the greatest living writer in (or outside) the fantasy genre.